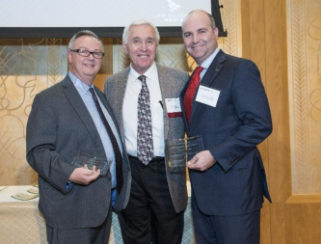 From left to right: Co-Counsel Mark D. Prince, JVR Editor John Kirkton and Attorney William T. Gibbs receiving the award on Oct. 26, 2017. 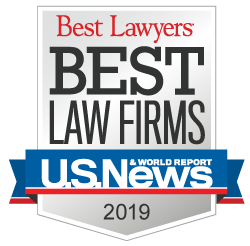 Corboy & Demetrio Partner William T. Gibbs received a 2017 Trial Excellence Award from the Law Bulletin Publishing’s Jury Verdict Reporter for having the Highest Reported Verdict or Settlement in Jackson County. A story about the settlement appeared in the Jury Verdict Reporter’s Annual Awards Issue, which was published on Jan. 16, 2018. Bill received the award for a $4 million settlement for Ryan Williamson, a 33-year-old tree service worker who suffered a traumatic brain injury after he was struck in the head with a clevis when the tow strap it was attached to suddenly failed as Ryan was attempting to dislodge a tree stump from the ground. Gibbs’ co-counsel on the case was Attorney Mark D. Prince of the Prince Law Firm in Marion, IL.